Saturday 7th April saw almost 1800 runners take on the 29th annual Omagh Half Marathon hosted by Omagh Harriers. Competitors were greeted by perfect running conditions of mild temperatures, light winds and no rain. Pre race favourites Stephen Scullion (Clonliffe Harriers), Declan Reed (City of Derry AC) and Greg Roberts (City of Derry AC) set the pace from the start and quickly moved to the front to dominate the race. As the race progressed it was Stephen who took charge as Greg was the first to fall off from the leading group and despite his best efforts, NI & Ulster Senior XC Champion Declan, just couldn’t compete with Stephen’s pace. Stephen claimed victory in 1.07.01 with Declan running a personal best of 1.07.55 for second. Greg completed the podium in 1.11.24. In the ladies race Ann- Marie McGlynn produced a personal best on 1.14.28 to win the race with a dominant display of running. Nakita Burke (Letterkenny AC) finished second in 1.21.17 and Gerrie Short (Beechmount Harriers) was third in 1.24.56. Springwell RC was well represented at the event with a number of personal bests recorded. The very popular Whitehead Easter Monday 5 Mile Road Race was greeted this year with rain and strong winds. Despite the conditions Springwell RC’s Stephen Joyce ran an excellent 30.56 to finish 9th overall and win the M40 age category. Sunday 8th April was a busy day for Springwell RC with members representing the club at events in New Zealand, France, the Netherlands, England and here in Northern Ireland. Furthest East, and therefore first on the road was Becky Coulter who took part in the Auckland Half Marathon, finishing 470th in a time of 1.51.23. In the Netherlands our Canadian husband and wife team of Simon Stewart and America Aznar had excellent runs, despite the warm weather, at the Rotterdam Marathon. Simon came within 9 seconds of breaking his own club record as he ran a brilliant 2.38.45 to finish 94th, while America ran an excellent 3.08.44 to finish 783rd. In France, where the weather was even warmer, Alison McAllister took on the challenge of the Paris Marathon finishing 34214th in a time of 5.02.05. 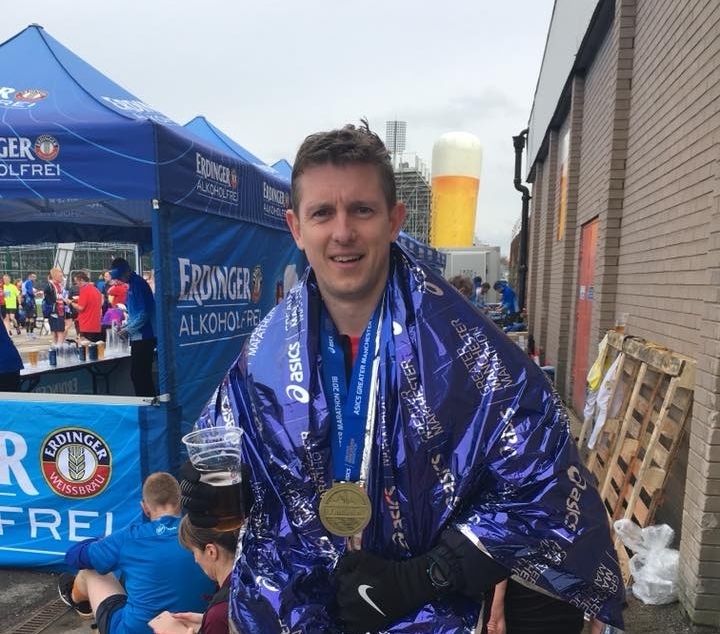 Springwell RC’s Simon Stewart at the Rotterdam Marathon. 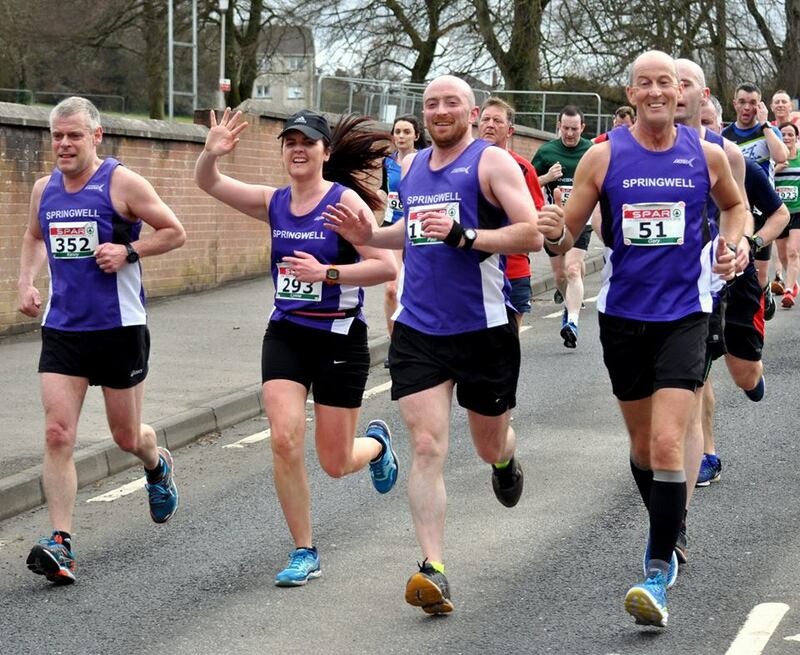 Closer to home three of Springwell RC’s members travelled to Manchester for the Manchester Marathon. Despite the fact that he had only recently recovered from illness Jason Scott still ran a sub 3 hour race, finishing 286th in a time of 2.56.58. Anthony Higginbottom was 1364th with a time of 3.21.05 and Helena Dornan was 3524th in 3.51.04. Springwell RC’s Ali McAllister at the Paris Marathon. In the TQ 10k three of our members took in the sights of the Titanic Quarter as they took part in this very popular 10k race. Gillian Jones finished 355th in 50.19 and Phyllis McGraw was 448th with a time of 53.22. Having already taken part in Saturdays Omagh Half Marathon, Catherine Byers finished the TQ 10k in 1.01.27 and 744th place. Springwell RC’s Jason Scott at the Manchester Marathon.